Imagine spending your holiday in the Sicilian sunshine sat beside a shimmering pool surrounded by a verdant garden of lush grass and shady olive trees filled with birdsong and butterflies. Casa Palazzelle is a tranquil and lovingly renovated Modican farmhouse with a stunning private pool sent in a large high-walled professionally maintained garden. Very private and secluded, it is surrounded by stunning unspoilt countryside and is just 5 miles from the UNESCO World Heritage rated historic centre of Modica. The house fully renovated and furnished to a very high standard with HD TV and Wi-fi internet access. 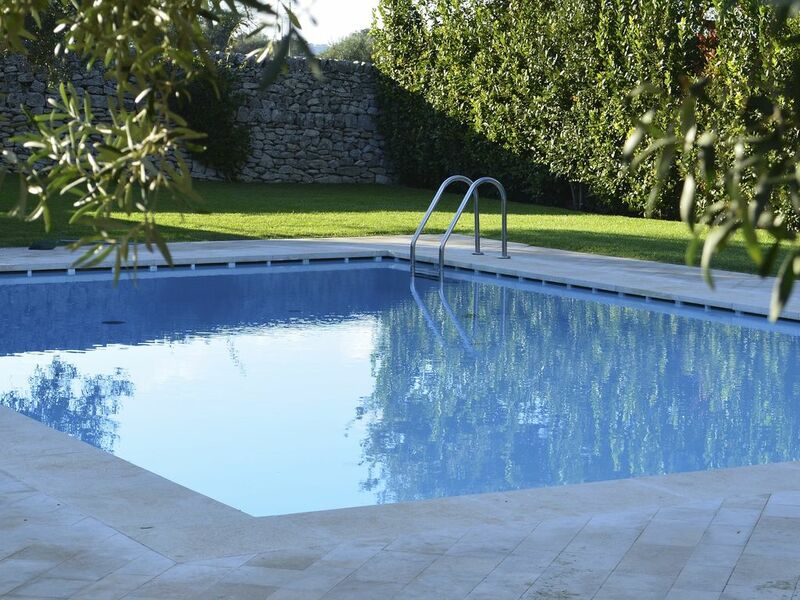 The pool is surrounded by patios of the local white stone, set in a secluded orchard garden of fruit and olive trees. The property has extensive views over open countryside, hills and the sea. Its elevated position and thick stone walls help to keep the house naturally cool in the summer. The house also boasts an array of traditional features such tall dry-stone walls, a wood fired pizza oven and large paved courtyard. A very popular and high quality resturant is situated just 50 meters from the house. Very near to Modica, it is also close to other UNESCO World Heritage sites at Cava di Ispica, Ragusa and Noto and is only 45 minutes from Siracusa. We are an Anglo-Italian couple who live and work in South East England. Francesca is Sicilian, while Sean is from the UK. We met in Sicily in 1994, and were married on the island in 1997. We love Sicily and never tire of its unique character and charms and have visited the island whenever we can. Since the arrival of our children we have felt the need to have a property in which to spend time with friends and family in a comfortable environment, and to give our children the best possible opportunity to learn the language and culture of their second home. Because the house is our home from home you will find that the property has been finished to a very high standard. We make a particular effort to respond to suggestions made by our guests to ensure the property improves year-on-year. Although Francesca is from Palermo in the Northwest of the island, we came to choose a house in the South East because it has a unique character that represents all of the best things that Sicily has to offer. The countryside in this area is absolutely idyllic, with stone houses, drystone walls and deep gorges. Modica is a city with great charm and beauty and by Sicilian standards it is very clean and well preserved. It is a relaxed and cosmopolitan city famous for chocolate production and with a great reputation for food and wine. The beaches and the sea nearby are also outstanding, they are almost all broad and sandy and very safe for children. Even in high season they are not busy. You can choose between unspoilt solitude to fully serviced beach clubs and all things in between. 2 luxury fully tiled bathrooms with large powerful showers, sinks, toilets, bidet (main bathroom only) and towel heating radiators. The hot water is solar heated and there is a hairdryer provided. Bathroom towels are also provided. Leather sofa and double sofa bed, a glazed book case containing a selection of books about Sicily, coffee table, wall mounted HD TV, with Sky Italia HD package, Blu-ray DVD player and B&W Zeppelin iPod dock HiFi. Featuring a high quality, newly fitted and fully equipped kitchen with solid wood units and solid granite work-tops. It boast a stainless steel oven and gas hob, and a large fridge and a separate freezer. A dishwasher is also installed. Accommodation is on one level so the property is very good for people with reduced mobility and for young children. Notes on accommodation: The house's agent is British and based full time in Modica. He meets guests on arrival and is on hand to provide assistance as required. A welcome pack of provisions is provided for guests on arrival. The property is particularly suitable for families with young children as access to the pool can be controlled via the orchard gate. The house is centrally heated in the winter months and for hotter months there is a portable air-conditioning unit and several floor fans provided. Water is heated from a roof mounted solar panel. The interior of the house is naturally kept cool due to the very thick stone walls and shutters. A broadband Wi-Fi internet service is also available for guests' use at no additional cost. Outside: The private swimming pool is situated in a secluded high walled orchard and is surrounded by a extensive patio made of local Modican white stone. The area is furnished with sun loungers and is very secluded and quiet. The garden is professionally maintained and planted with mature olive and fruit trees and a selection of flowering plants all set on a lush lawn of soft grass. There are 2 large patios for dining, one which is fitted with a built-in barbecue and sink and covered by a large timber gazebo. It has a hard wood table and chairs. The cobbled courtyard features an outhouse which contains a traditional wood-fired pizza oven. There is a bistro table and 4 chairs for use on the patio to the front of the house. In the pool area there is also an outdoor shower with hot and cold water. The entire outside area of courtyard, pool, patio and orchard is illuminated to create a relaxing ambiance during the evening. Utility Room: Features a fast-spin Hoover washing machine, iron, ironing board, drying frame. Cleaning / Towels / Linen / Maid service: Towels and linen are included and changed weekly, the property cleaned weekly at no additional cost. Other: A traditional outdoor kitchen in a dry-stone out building with a traditional wood-fired pizza oven, with wood and cooking implements provided and a built-in sink. Lovely pool. Ramsey (your local contact) is a legend. House is clean and so pretty. The one star off the 5 was probably due to bad luck, where the Pizza restaurant had a couple of parties to 3am. However this was just 2 days of the 14 that were truly memorable. Loved the facilities and the Island - would heartily recommend!! Excellent. Clean, spacious, lovely garden and pool. Great location for touring the area. Attractive, villa in local stone. Very well maintained inside and out. Ideal for 2 couples or a family group. We had two wonderful weeks in South East Sicily staying at this comfortable farmhouse. The highlight was the fabulous swimming pool in the secluded garden surrounded by rock walls and tall bay hedges. Ramsay was extremely helpful and friendly and nothing seemed too much to ask. He was waiting at the villa on arrival, supplied us with plenty of local information, was at the end of the phone when we had hire car problems and worked very hard for us dealing with the Italian mechanic and the hire company. The nearest town was well supplied with shops, bank and cafe which was run by a delightful family. Monica was about 10/15 minutes drive with plenty of good restaurants and bigger shops. We will return to the villa as we all loved it and the surrounding countryside and the Sicilian people. Fine villa but not quite luxury! The villa was fine if a little tired in places. Biggest plus is the great pool and garden area. Biggest negative is no effective air conditioning. Was very hot sleeping at night but it was Sicily in August. Great location close to fabulous baroque towns and coast. Perfect if you are a Montalbano fan! Great village Frigintini close by for all your daily needs - butchers, bskers, fresb fish, greengrocers, Conad, bars and a couple of very decent restaurants/trattoria. ..... and yet within easy reach of all the main attractions of south eastern Sicily. The property is clean and well presented with a well equipped kitchen with everything you could possibly want or expect. The accommodation is compact but suited our needs well (family of two adults and three pre-teen children) and seems larger inside than you would expect from the outside. This is supplemented by a lovely covered outdoor dining and barbecue area, which we used for lunch and dinner when we weren't out and about. The garden is a private oasis, bounded on all sides either by high stone walls or manicured hedges. It is regularly and beautifully maintained, contains the only green grass you will see in Sicily in the summer, and natural shade is provided by the olive trees that grow in it. The swimming pool is surrounded by an elegant terrace of laid stone tiles and provides a wonderful refuge from the heat. The children would have spent all day in it if we'd let them! We spent just under two very happy weeks staying at the Casa Palazzelle during a heat wave with daytime temperatures regularly at 40 degrees centigrade or above. Even the thick walls of this sturdily built former farm house couldn't quite keep all of that heat out, but opening windows morning and evening and using the fans provided helped. With Modica 15 minutes away by car and Ragusa, Scicli and Noto all within half an hour's drive, there is no shortage of picturesque places to visit and good cafes and restaurants to choose from. The Torre Palazzelle restaurant just 2 minutes walk along the road is a hidden gem and offers good value pizza (we also saw people ordering pizza to go) and more up market dishes as well. The nearest beach, which is has an EU blue flag is found in the attractive seaside town of Pozzallo, just 14 miles from the house. The world renowned nature reserve, the Vendicari, is 20 miles away and is famous for its quiet unspoilt coves and beaches, as well as its flamingos. The beaches in the region are broad and sandy with lots of shallow water free from currents. Even in the height of summer the local beaches are not overly busy. The nearest airports are Catania (60 miles) and the newly opened Comiso Airport (30 miles). Palermo Airport is 200 miles away and Trapani is 260 miles. The connection to Catania has been greatly improved following the opening of a new autostrada. The journey by car should take 1 hour 15 minutes. A hire car is strongly recommended to make the most of the local area. The nearest towns and villages and places of interest are: Modica (5 miles), Frigintini (3 miles), Ragusa (10 miles), Cava di Ispica (4 miles), Noto (18 miles) the Vendicari Coastal Nature Reserve (20 miles) Siracusa (37 miles). The small town of Frigintini has a good array of small shops, and a couple of restaurants, specialising in local produce. Modica which is a short drive away has all amenities including an outstanding collection of restaurants from family trattorias to Michelin starred fine dining. The area is great for walking in the spring and autumn, in particular, the gorges at Cava di Ispica are famous and notable enough to have a UNESCO listing in their own right whilst the Vendicari Nature Reserve provides unspoilt beaches, good walking and the opportunity to see local wildlife, including migrating flamingos. Nearby there are riding stables and opportunities to visit local wine and olive oil producers. Changeover Day: Changeover day is Saturday. Notes on prices: Prices during Spring, Summer and Autumn seasons include use of the pool. The pool is closed during the Winter period.